This past spring quarter, for the course “Conservation Laboratory: Organics III” (CAEM 241), I had the opportunity to examine and treat a polychrome mask (X91.470) from the collection of the Fowler Museum at UCLA. 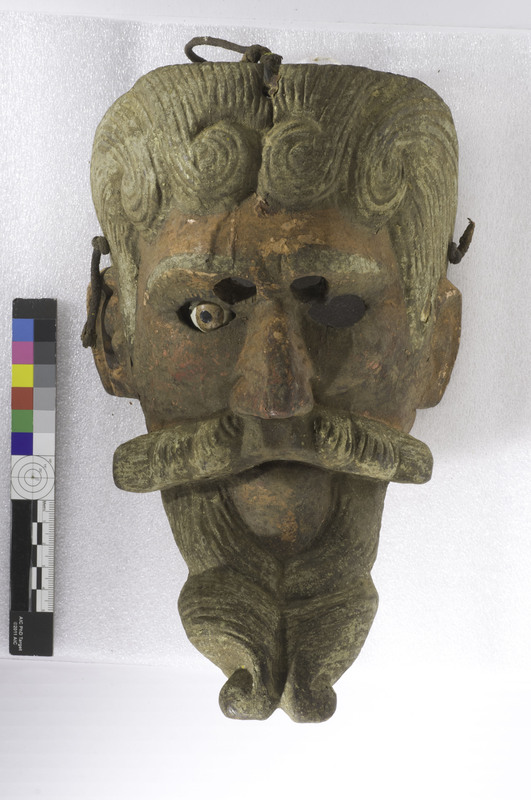 The polychrome mask is made of carved wood and is likely meant to depict the face of a conquistador, with detailed curling hair, a long beard and mustache, and a light complexioned, pink face. Masks such as this one are commonly used in ceremonial dances in Guatemala, and one such as this may have been used in the Dance of the Conquest, a dramatic dance that depicts the Conquest of Guatemala by the Spanish in 1524 (Pieper 1988: 39) . You can see a portion of this dance in this YouTube video, where several of the dancers are wearing a mask similar in appearance to the Fowler conquistador mask. The mask is painted with thick layers of paint that are currently heavily obscured by a thick accumulation of soiling that is likely on top of a discolored surface coating. Guatemalan dance masks are traditionally professionally maintained by costume shops called morerias, which apply fresh paint to keep them looking new. The age of the mask is not necessarily considered a marker of value, and it is actually preferred that the masks look new and well maintained when they are danced. Some masks may be blessed by an indigenous Shaman or Catholic priest (Pieper 2006: 43-45) . Historic accounts of the maintenance of these masks do not refer to the application of any surface coatings as a protective measure for the polychromy. 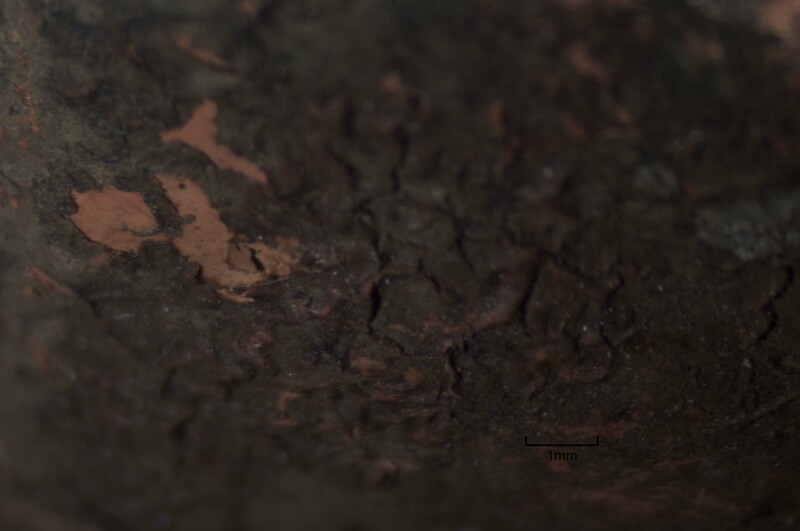 The majority of the painted surface of the mask is obscured by a thick layer of a dark, grimy material with embedded soiling (fig. 1-2). It is unknown when or for what purpose the coating was applied to the mask, but it may have been applied for surface protection of the polychrome or to consolidate flaking paint. Figures 1 and 2. 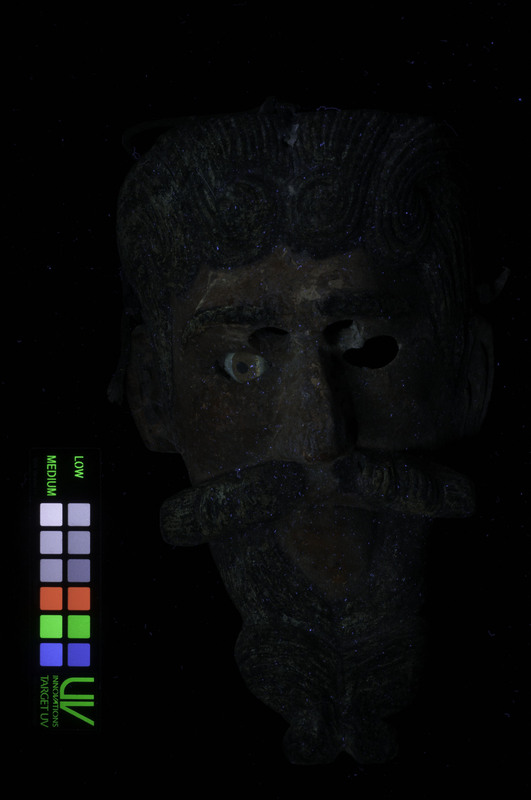 An image of the front of the Conquistador’s mask (X91.470) (left) with a detail (right) of the area of the nose showing the discolored surface coating. 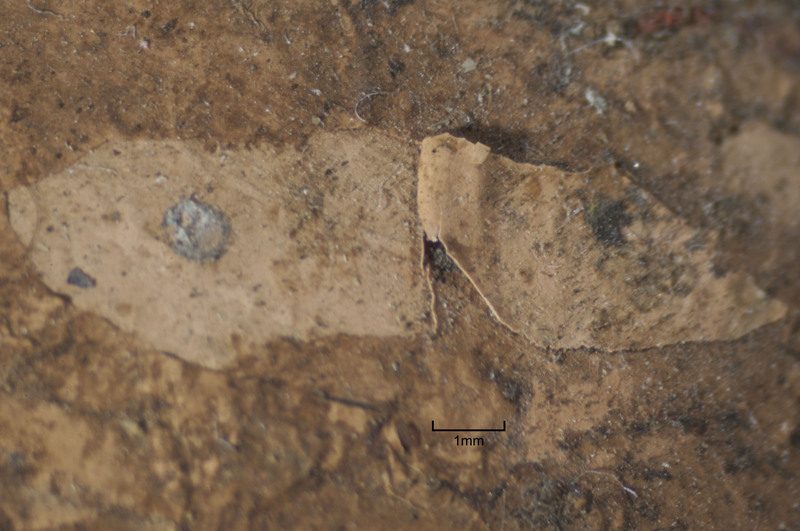 Under stereo binocular magnification (7-45x), the material has a varied appearance, at times appearing like a matte coating that is heavily embedded with soiling of a granular nature (fig. 3), at times flaking (fig. 4), and in other instances appearing thinner, with a somewhat sticky texture, but less accumulated matte material (fig. 5). Figure 4. Dark surface material that is flaking. Figure 5. Some of the dark material on the surface appeared thinner and sticky, and some areas had a matte appearance. There are also areas where the surface coating has a wrinkled appearance, as if it has shrunk and pulled away from the surface, and in these cases it appears to be pulling the paint layer with it (fig. 6). The wrinkled areas look the way that paint looks when a commercial paint stripper is applied. 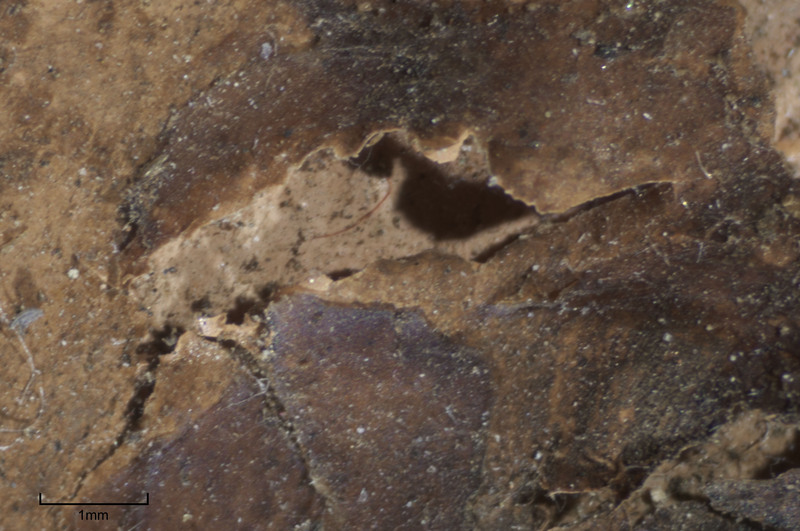 In all of its iterations, it appears to be inextricably linked with flaking paint layers beneath it (fig. 7). Figures 6 and 7. In some areas the surface coating appears as if it shrunk and pulled away (left). Regardless of the appearance or texture of this coating it is inextricably linked with flaking paint layers (right). There are a few areas where the obscuring dark coating is not as present. 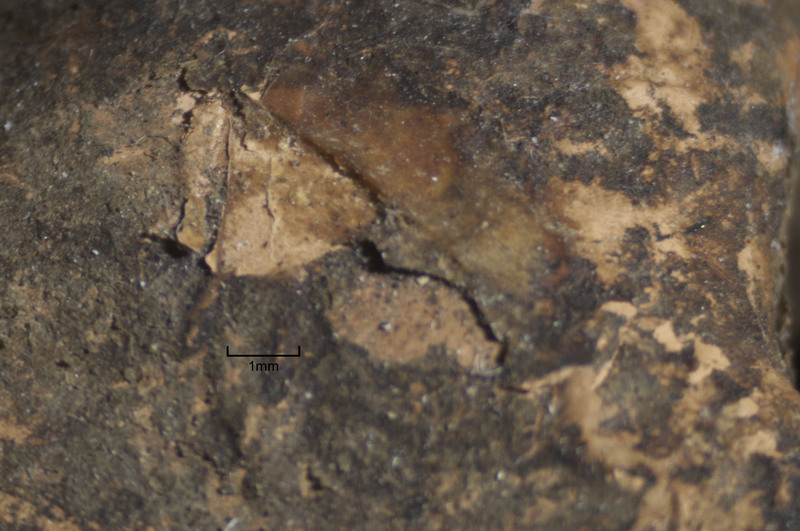 In these areas, it appears that there may have been an attempt to remove it, which resulted in peeling away of the top paint layer as well (fig. 8a and b). In these instances, the pink paint film has been pulled away and is folded over onto the surface of the mask and adhered in place. The areas of folded paint film appear to be brittle and have shattered in some locations along the edges. There is a sticky, light brown resinous material that has accumulated in the crevices of these surfaces, which is likely deposited residue from the surface coating. In addition, a distinct layer of soiling has accumulated on top of the coating. Much of the soiling appears embedded within the coating, but there is also loose surface dirt that can be moved with a soft brush. Figures 8a and b. In some areas, it appears as if there was an attempt to remove the coating (left) which resulted in peeling away of the top paint layer (right). The object was illuminated with ultraviolet radiation at λexcmax=300-400nm and captured with a Nikon D90 digital camera affixed with the PECA 916 filter (visible range). The soiled coating that covers the face appears largely absorbing. Areas of fluorescence occur where the flesh colored paint is exposed without the coating (fig. 9). Figure 9. Under examination with a UV light (λexcmax=300-400nm) the soiled coating appears largely absorbing. Areas of fluorescence occur where the flesh colored paint is exposed without the coating. Solubility testing was conducted in situ on the mask with room temperature deionized water, warm deionized water, acetone, ethanol, toluene, and mineral spirits. The coating was unresponsive to cool water, acetone, ethanol and mineral spirits, but a slight change in appearance was noticed when toluene was applied, though none of the coating was removed onto the swab. This surface change was fleeting and the coating returned to its original appearance immediately. 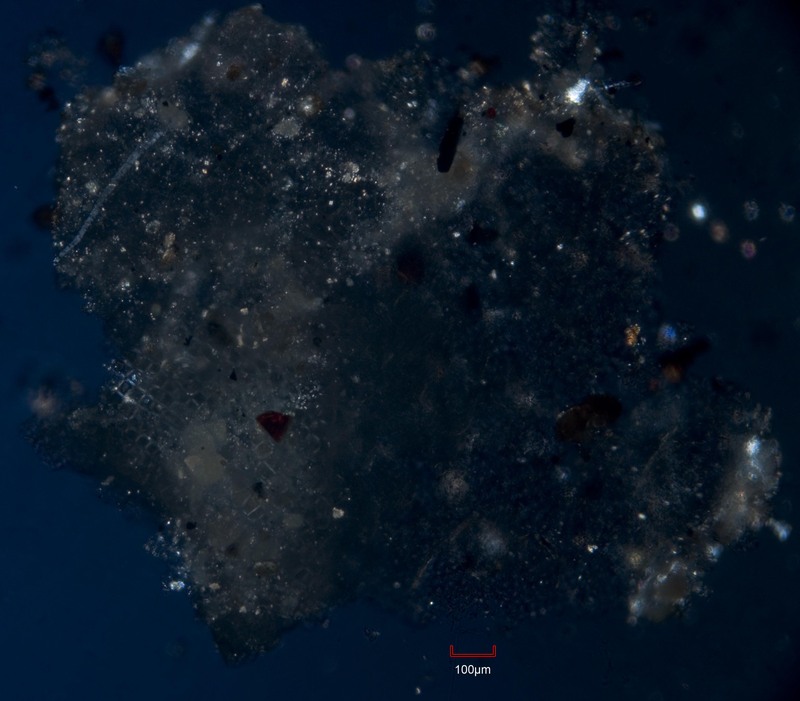 Just to be certain that the coating was insoluble in toluene, the application of toluene on a small sample of coating that had flaked off of the surface was observed under stereo binocular magnification at magnifications of 7-45x. 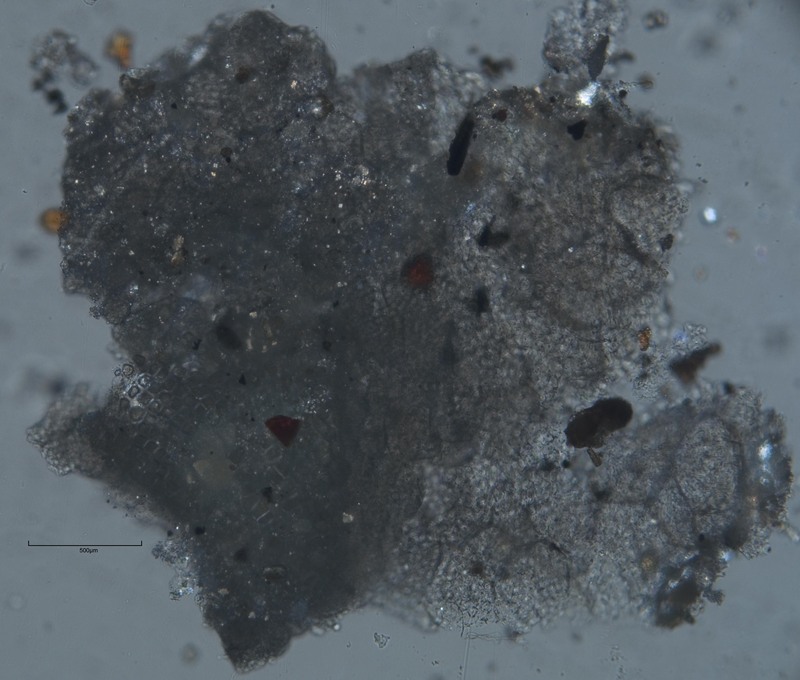 No dissolution or swelling of the coating material was observed (fig. 10). Figure 10. No dissolution or swelling of the coating material was observed in toluene. The mask was undergoing treatment because the painted surface was unstable and was lifting and flaking. Gelatin was under consideration as a consolidant for the flaking paint and therefore warm water was also tested to ensure that a warmed gelatin solution could be used without disrupting the appearance of the coating. Unfortunately the warm water was found to swell and eventually solubilize the coating so that it could be swabbed away with gentle pressure. The interaction of the coating with warm water was further investigated by observation under stereo binocular magnification. 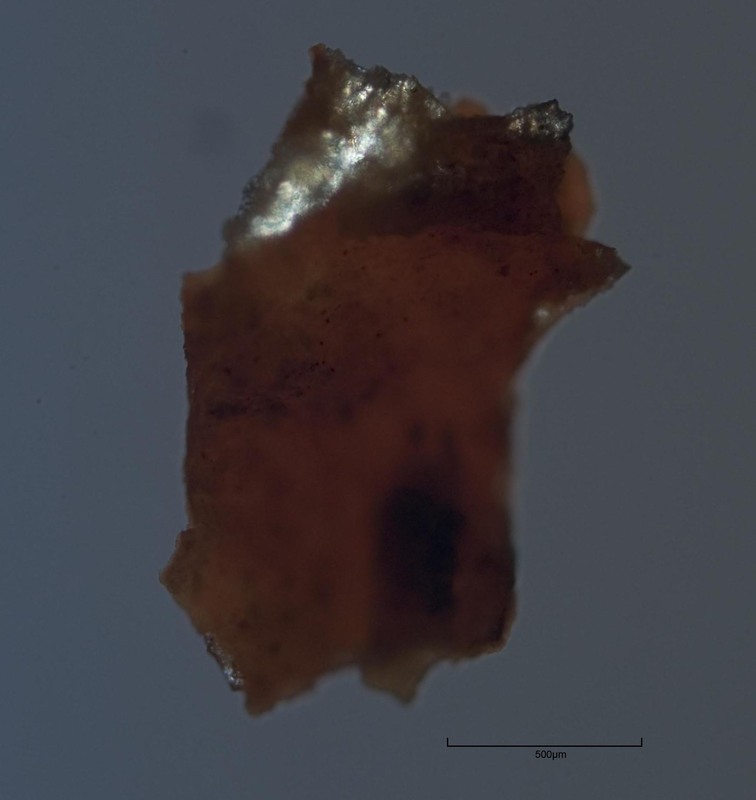 As the sample soaked in the warm water the brown material on the sample surface swelled into fluffy blobs on top of a more transparent, clear base. 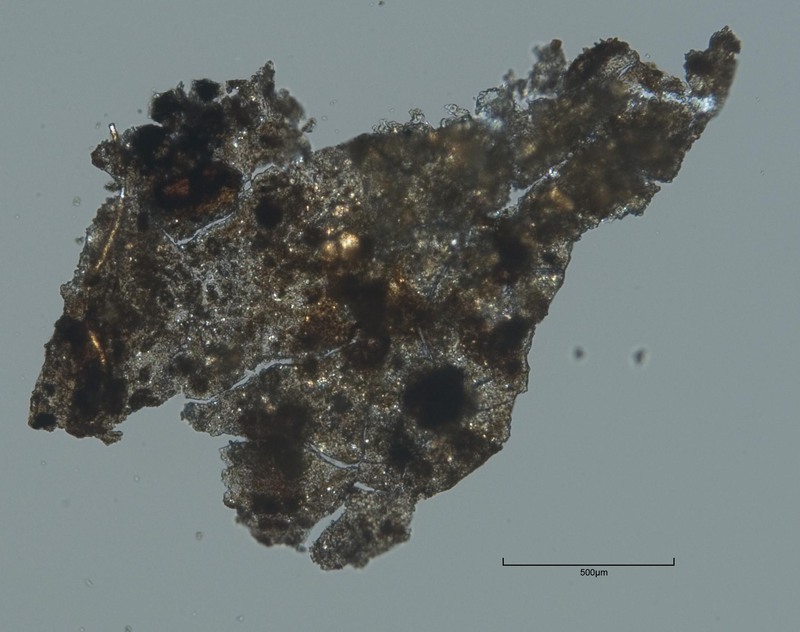 Over a period of time the clear, striated section of the sample also appeared to swell slightly (fig. 11). Because warm water was observed to have an effect on the coating, a small cleaning test was conducted in a discreet area of the mask using warm deionized water applied by swab under stereo binocular magnification. The coating was greatly reduced using this method and it is very likely possible that it could be removed simply using warm water, if removal were desired. Though the solubility in warm water introduced a possible complication with using a warm, aqueous consolidant such as gelatin, the fact that the gelatin would remain soluble in water was also a possible advantage to using this consolidant; should the removal of the consolidant be desired in the future, it would be beneficial if it was not consolidated in place with a system using toluene (the only solvent besides water that did not affect the paint layers below) for toxicity reasons. Figure 11. Swelling of the coating was observed in warm water. 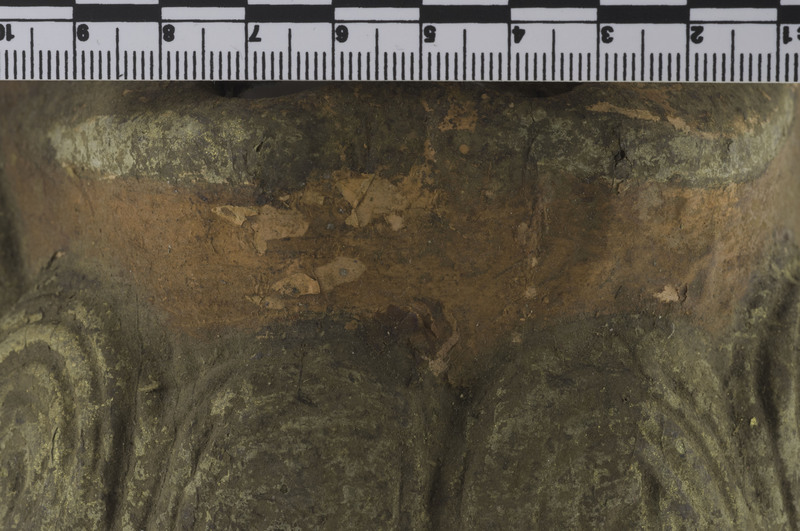 Two small samples of the pink paint was removed from a discreet area of the mask where the paint layer contained a layer of the dark coating and was observed to be flaking. 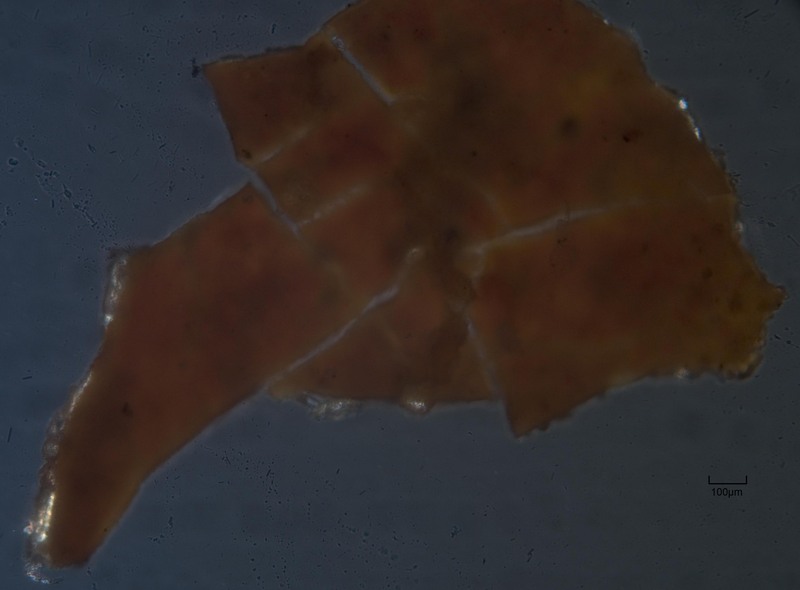 This flake was viewed in transmitted light using an Olympus BX-51, polarized light microscope at magnifications between 50-200X. 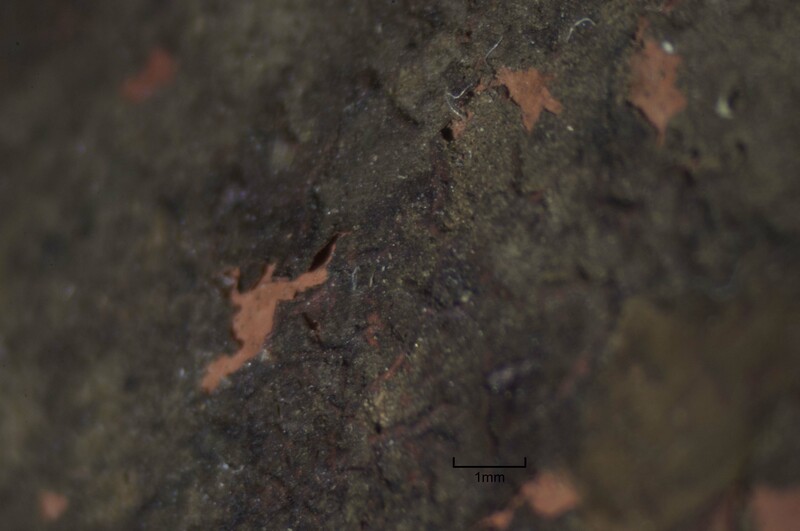 Using this technique, it was not possible to observe the layers as distinct entities, however, at the edge of the paint flake and within interstices of the flake, small sections of the coating could be observed. It appeared to have a somewhat clear and amorphous structure (fig. 12a and b). Figures 12 a and b. Examination of a paint flake with the coating viewed under transmitted light. In addition, several small samples of the coating were removed from the mask during a light surface cleaning procedure. These samples were soaked in warm water as described above, in order to further characterize the solubility of the material. These samples were viewed in transmitted light under high magnification and also in cross-polarized light. (fig. 13a and b) The samples appeared to swell from exposure to the water. The material was quite clear, and had the appearance of an organized cellular structure in some areas. Figures 13a and b. Examination of the coating using transmitted (left) and cross-polarized light (right) after swelling in warm water. Two microchemical tests were conducted in the hope of possible identification of materials present: a test for polyamides using p-dimethylaminobenzaldehyde (Odegaard et al. 2000: 170-171), and a test for protein using copper (II) sulfate (Odegaard et al. 2000: 144-145). The test for polyamides was conducted to confirm or deny the presence of nylon, had the mask been treated with soluble nylon (N-methoxymethyl nylon, a chemically modified form of nylon that is produced by treating nylon with formaldehyde). Soluble nylone was a common consolidative conservation treatment for powdering or flaking paint beginning in the late 1950s. Objects that have undergone treatment with soluble nylon have been observed over time to exhibit numerous problems including accumulation of disfiguring and obscuring soiling in the nylon film, the film exerting strong contractile forces which peel away surface layers from objects, and the film losing flexibility and becoming insoluble (Sease 1981). These descriptions of the degradation characteristics of soluble nylon in the literature were similar to the appearance of the coating on the Fowler mask. Neither the age of the mask nor its conservation history are known, and it was possible it could have been treated at a time when soluble nylon was a popular conservation treatment. The result of the spot test was negative and was compared to a known positive result (color change to red of filter paper used in the test) from a nylon sample taken from the ResinKit™. The protein test was conducted because of the coating’s swelling effect in warm water. In addition, from the literature it is known that at high RH levels animal glue films can experience severe shrinkage due to contraction of the glue matrix, and in some instances the coating appears to be undergoing contractile shrinkage as described (Schellmann 2007). The result of the protein test was negative and was compared to a known positive sample of gelatin. Based on the above observations and testing, the material constituents of the coating could not be identified. Nylon-based (such as soluble nylon) and protein-based (such as animal glue) coatings were ruled out based on the spot testing results. Knowing that the material is soluble in warm water is important information should the removal of the coating be desired in the future. At this time, because the nature and purpose of the coating have not been identified, its removal would not be an appropriate course of action, so it will be left intact. 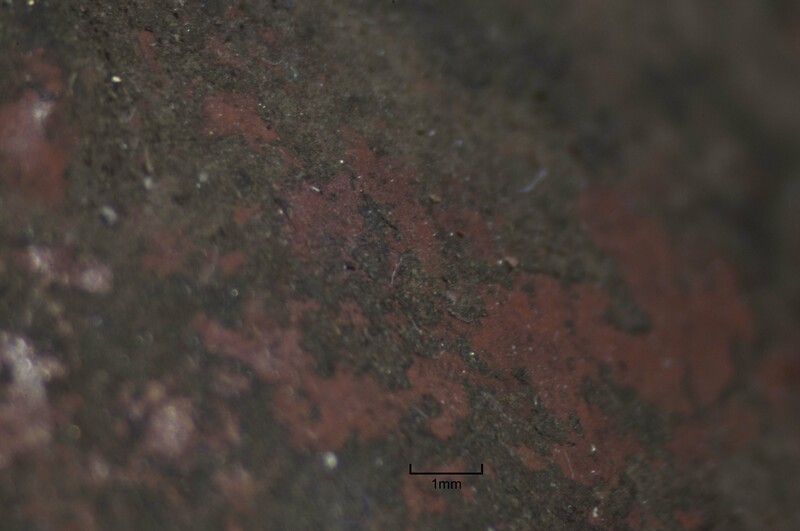 An additional problem posed by the presence of the coating is that the paint layers below it are flaking, and the coating may be contributing to or in fact causing the flaking. In order to consolidate the paint layers below without removing the coating first, the coating and accumulated soiling also become consolidated as a result. Even though warm water has the ability to swell or solubilize the coating, mechanical action is also required to remove it. Though the warmed consolidant did have the potential to interact with the coating, care was taken to only flow the gelatin under lifting or detaching paint flakes and to try to avoid saturating the coating with consolidant. This worked rather well in the areas of pink polychromy. When cleaning was required around the consolidation site, this was done immediately, and the coating was not affected. In the areas of the hair and beard, the nature of the coating was somewhat different, as described above (fig. 4). When this iteration of the coating came into contact with the warm gelatin, it solubilized quite easily. Again the focus of the treatment was consolidation of localized areas of active flaking or evident wood deterioration, and care was taken in choosing sites in which to introduce the consolidant by brush without disrupting the coating. When the consolidant was applied with care under binocular magnification, the coating was not at risk of being removed. Furthermore, by using this aqueous consolidant, the solubility of the coating in warm water should not be affected, should its future removal be desired. Odegaard, Nancy, Scott Carroll, and Werner S. Zimmt. Material characterization tests for objects of art and archaeology. Archetype, 2000. Pieper, Jeanne, and Jim Pieper. 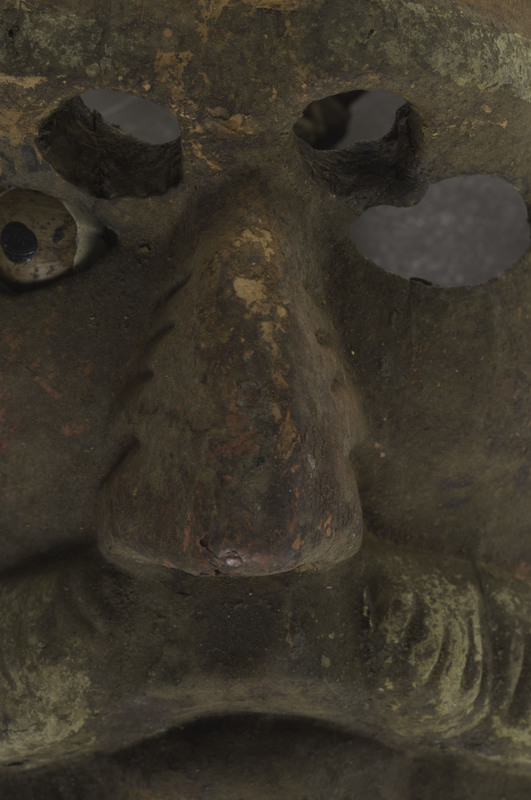 Guatemalan Masks: The Pieper Collection. Craft and Folk Art Museum, 1988. Pieper, Jim. Guatemala’s Masks and Drama. University of New Mexico Press, 2006. Schellmann, Nanke C. “Animal glues: a review of their key properties relevant to conservation.” Studies in Conservation 52, no. Supplement-1 (2007): 55-66. Sease, Catherine. 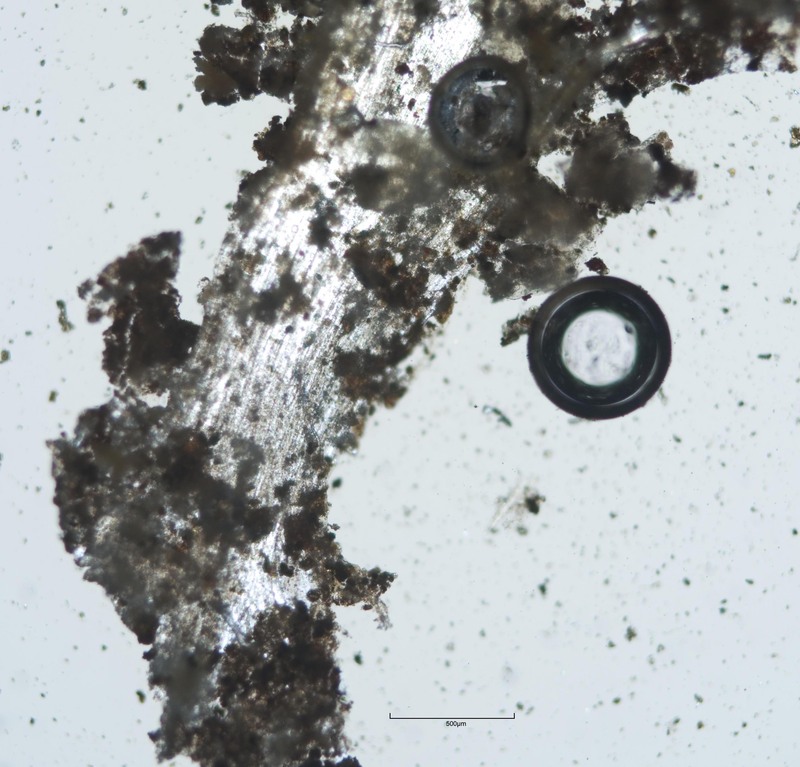 “The case against using soluble nylon in conservation work.” Studies in Conservation 26, no. 3 (1981): 102-110. Categories: Det. & Conservation of Organic Materials III | Tags: coating, Fowler, Guatemala, mask, polychromy | Permalink.